A giant Moodmark Painter seals Grand Prix victory for the trio. THE HASHTAG FOR GRAND PRIX DENVER IS #GPDENVER. JOIN THE CONVERSATION. It took all weekend, but finally Jack Dobbin lost. He was individually undefeated in Grand Prix Denver entering the finals, but Peter Yeh knocked him off in three tight games, which meant Dobbin's team would have to do something they hadn't done all weekend - win when he lost. They had his back. 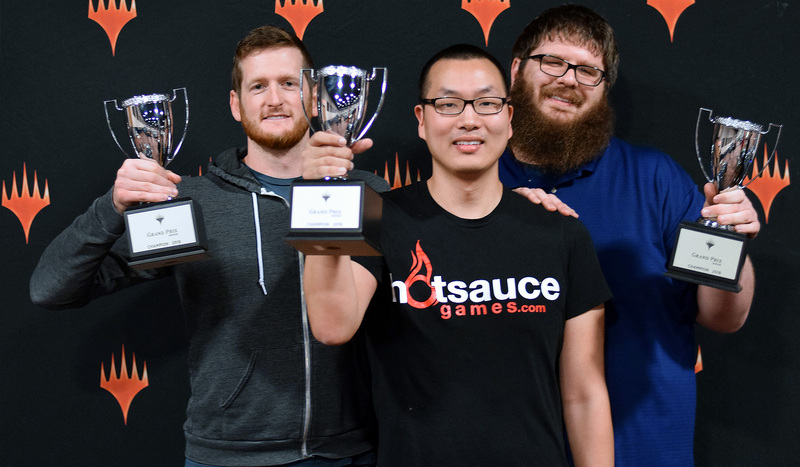 Jacob Baugh and Andrew Tenjum both won their matches - with the deciding blow in Tenjum's coming off a massive Moodmark Painter - and with that the trio became the champions of Grand Prix Denver. It was a wild event from start to finish, with a snowstorm hitting midway through the event while pros clustered around the top of the standings as the tournament heated up. In the end, it came down to Yeh, John Rolf and Brandon Ayers sitting opposite of Dobbin, Tenjum and Baugh, and Tenjum gave them something to smile about. Congrats again to the champions of Grand Prix Denver! It's been a series of unlikely events so far at Grand Prix Denver. The pre-tournament favorites Peach Garden Oath are out, and two teams stand shoulder to shoulder at the top, poised to make a run at the Top 4. And no team was more unlikely to finish 8-0 than the squad of Michael Malone, Dustin Flora and Jesus Buenrostro, who booked a same-day ticket from Los Angeles to join after their previous teammate Jimmy Smith lost his home in the hurricane that battered the southeastern United States earlier in the week. It's an underdog story that will headline the tournament when we return for Day 2 and a run to the Top 4 Sunday in Denver. Plenty of big names lurk around the top at 7-1, and also entering Day 2 undefeated is the trio ofJacob Baugh, Jack Dobbin and Andrew Tenjum. You can follow the tournament here all weekend as another round of Guilds of Ravnica Limited will cap things off on Sunday.